Fragments are modular building blocks for creating a responsive Android UI. They help you to target different devices and screen sizes while at the same time avoiding code duplication. 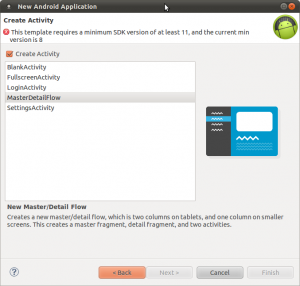 This post starts with the Android Developers Tools generating a project for you. I then explain some of the generated code and will show you how to make this code work on older devices. To do this kind of post was suggested by a user of a German forum. Let's see if this works well. This project will grow over time. In the next post I will add the ActionBarSherlock library to the project - but this time it's all about understanding the basics. This post is not taking the approach, Martin van Z or Sebastian Kaspari are taking with their respective series "Creating your own Android app" and "Instant Moustache". They cover planning stages, sketching and the like as well. Both series make for very interesting reading! Fragments constitute a part of your Activity you present to the user. Most often they are used to display some section of the screen and to react to events that happen within this section. Fragments are modular, come with their own lifecycle and help you to avoid code duplication. Fragments come in two varieties. 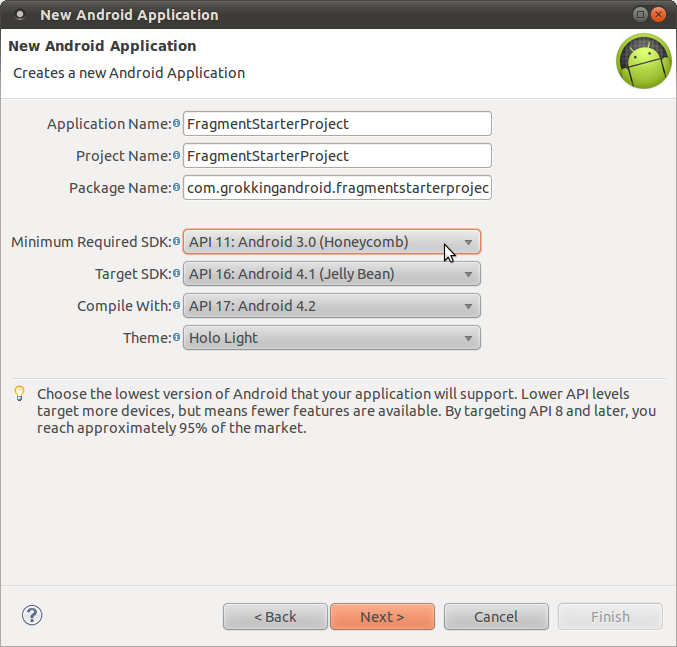 Either the normal Fragment class within the android.app package that was introduced with API level 11 (Honeycomb). 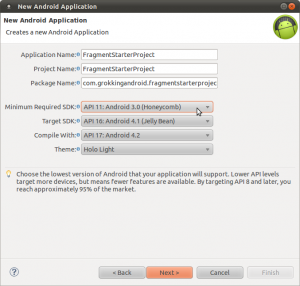 And the support library Fragment of the package android.support.v4.app. Both have subclasses like DialogFragment or ListFragment. You cannot use a mix of normal and support libary fragments. If you want to target older devices in your project, always go for the classes of the support library. If you only care about newer Android releases, you can use the normal fragments. In this post I specifically have a look at how to make fragments work with the support library. Given the vast amount of Android 2.2 and 2.3 devices currently out there I still recommend to always try to target these devices where possible. And since the differences in the Android framework between Android 2.1, 2.2 and 2.3 are not too big, I suggest to try with 2.1 and only increase the minimum API level if you have a need for this. Fragments have a UI on their own. As usual you inflate your view, which you have defined in XML files. While Fragments without any UI are possible, I won't cover those in this post. View creation is nothing special. Apart from one thing. If you use the android:onClick attribute for your view elements, you cannot implement the method in the fragment. You have to implement it in the activity. If you want to deal with click events in your fragment you have to add OnClickListeners for those view elements programmatically. Fragments have a lifecycle of their own. It is a bit more complex than those of Activities, because Fragments can be attached to and detached from their enclosing activities. I will cover some of the lifecycle methods below. So much for the background on fragments. If you want to learn more, head over to Google's documentation about Fragments after reading this post. 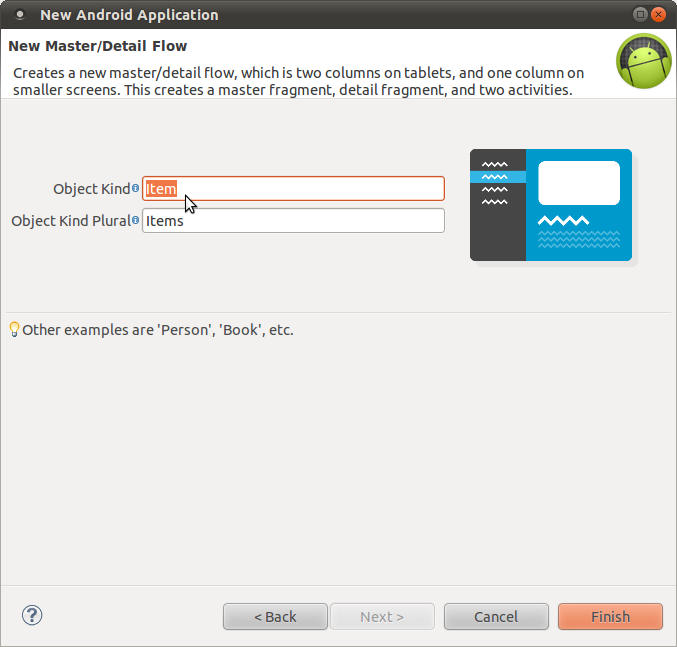 In the next section I start by creating the project using Android's Developer Tools. To follow the steps outlined here you must have Eclipse together with the Android Developer Tools plugins installed. You can download complete bundles on Android's SDK page. Project wizard for master detail projects. Note the API level warning. Select the master detail project type. That means that you have a list of elements on the left and a detail view on the right - if your screen is big enough. Item is the default here. I do not bother to change this, but you can change it to whatever your app is going to deal with - like Book, File and so on. Keep in mind that the wizard creates the names of the classes accordingly. So whenever I refer to Item, ItemListFragment and so on, substitute Item with the noun you have chosen in this dialog. Now click Finish and the Eclipse generates the project for you. I do not cover the entire lifycycle of Fragments. Much of it is comparable to the lifecycle of Activities. But by having a look at the code, I will show some common lifecycle methods you should know about. First, have a look at ItemDetailFragment. This fragment inflates a view. But it does not do so in the onCreate() method like you would do in an activity, but within the onCreateView() method. Android passes the inflater you need to use for view inflation into the method, as well as the container for your view. The last parameter states that your view should not be attached to the container. It must always be false for fragment view inflation. Android adds your view to the container itself! Since fragments can be attached or detached from an activity, there also exist onAttach() and onDetach() methods. After your fragment has been attached, you can use getActivity() within your fragment to get to the enclosing activity. The ItemListFragment makes use of both methods to set a callback interface. I explain this interface in the next section. The other lifecycle methods are the same as for activities. You can read more about the lifecycle in Android's documentation. Fragments and activities need to communicate with each other. But you do not want to couple them closely. Your fragment might end up in multiple activities, so it should never have a direct link back to the activity it belongs to. Instead it is common practice to use interfaces to deal with this. Your fragments define callback interfaces and your Activities must implement these interfaces. See also the methods onAttach() and onDetach(). That's where the internal member mCallbacks is set to the enclosing activity or to a dummy implementation, if this fragment is no longer part of an activity. The ItemListActivity implements this interface. So look at the activity's onItemSelected() method. It first checks if you are in dual pane or single pane mode (see next section). And depending on the result it either starts another activity or replaces the second fragment. When you have many callbacks and multiple fragments using interfaces for every fragment can become pretty unwieldy. In this case I recommend to use a bus based approach like EventBus or Otto. But that's a topic for another post. At the current state of the project the interface approach works fine. The most important reason to use fragments is to make your app responsive. That means make it adapt nicely to a change in orientation and to different screen sizes and aspect ratios. The generated project shows this by using two panes on tablets and a single pane on phones. It defines two layouts for the ItemListActivity in the layout folder: activity_item_list.xml and activity_item_twopane.xml. Wait a moment. Two layouts for the same activity with different names and both in the default layout folder? What's up with that? two-pane version on Large screens. Note the name attribute of the reference. Its value is activity_item_list. This means that when you use R.layout.activity_item_list in your code, Android will replace this value with R.layout.activity_item_twopane. Of course only if one of the two qualifiers large or sw600dp applies. That way you have to declare the layout only once and can refer to it in multiple places. You have to use the large qualifier even though a more specific qualifier is present, because the swXYZdp qualifier will only be recognized from API level 13 onwards. Prior to this only the screen qualifiers folders (small, normal, large and xlarge) have been recognized. 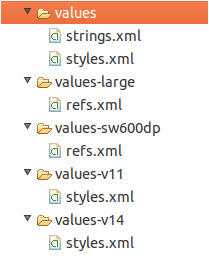 If you look at the activity_item_twopane.xml file, you will see that a fragment and a FrameLayout is declared. You can declare fragments either directly in your layout files or you can use FragmentTransactions to add fragments programmatically. In this case one fragment is added using the xml file while the other is added using a transaction. The FrameLayout within this file is the container that you later add the fragment to in your transaction. // activity should be in two-pane mode. So by either finding this container or not, the activity knows whether Android selected the two pane layout or not. Depending on this, the activity handles a list item click differently in the onItemSelected() callback method. There is also another approach used on some of Google's Android training pages and mentioned by Kiran Rao in the comment section. The other approach uses a boolean variable in xml files. Have a look at Kiran's comment to learn more about this approach. You should really dig deeper into how to deal with multiple screen sizes. It is a very important concept for supporting multiple device sizes in Android. Thus I recommend you take the training about multiple screensizes on the Android site after reading this post. Do not write apps for phones only. As has just been published, the tablet market for Android is gaining serious traction. Don't miss out on this. And don't risk bad ratings just because you ignored bigger screens! 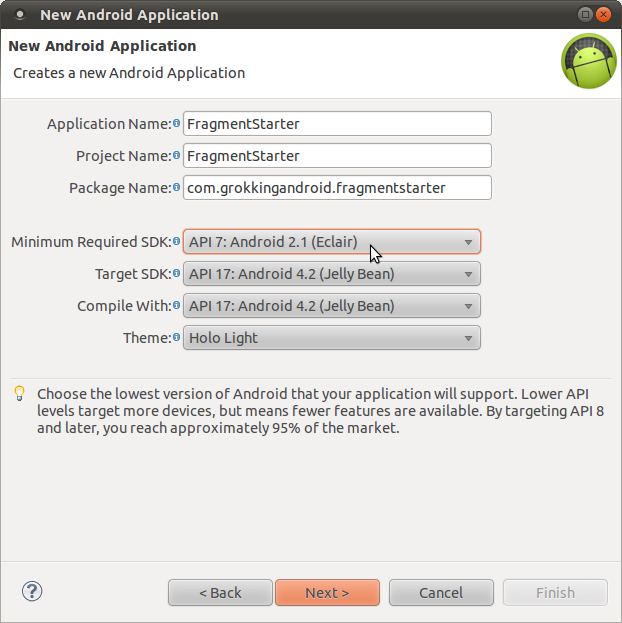 FragmentTransactions are Android's way of adding, removing, hiding or replacing fragments to or from your activity. As the name transaction implies either all actions of the transaction are done or none. So you transfer from one valid state of your app to another one. But you not only manage the fragments themself, you can also define custom animations to display for fragments being attached and detached. And you can add a complete transaction to your backstack. In this case clicking back would do everything within the transaction in exactly the reverse order. If you do not use the addToBackStack() method to add your transaction to the backstack, this transaction will be ignored. You can see this in the sample app in two pane mode. Clicking on different list items starts a transaction and causes a replacement of fragments. But by clicking back you just leave the app. Which makes sense, since you do not want every list item click to be added to the back stack. I have covered here just some basics of FragmentTransactions. To learn more about them, visit Daniel Lew's blog post about FragmentTransactions. The code was generated by the wizard for API level 11. But it uses the support library already - so shouldn't it run on older versions as well? The heavy lifting already has been done. The wizard created both activities as subclasses of FragmentActivity. This is a class of the support library that allows you to access an FragmentManager using getSupportFragmentManager(). Two changes are needed to make it run on older versions. First the generated class ItemListFragment contains a layout constant that has been introduced in API level 11: simple_list_item_activated_1. This specific layout highlights activated list items. Which is useful, if you have a multi-pane layout, because it shows the user which list item is selected and displayed in the details pane. With these changes, you can now run the project on older devices. 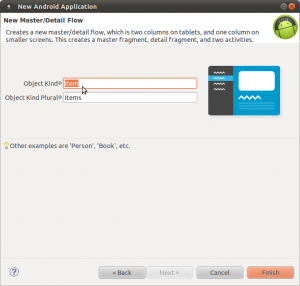 You have seen how to create a master detail project using the Android Developer Tools and how the generated project works. I have given you details about what fragements are and what to use them for. And I have shown you some code snippets of the generated project and explained why it is done that way. Also I have shown to you how to make this project backwards compatible. That way you can run the code on older devices as well. Keep in mind: The Android Developer Tools project is evolving at a rapid pace. So if you read this post in a few months some of this probably has changed - though the basics should remain the same. I strongly recommend to keep an eye on updates to the developer tools. 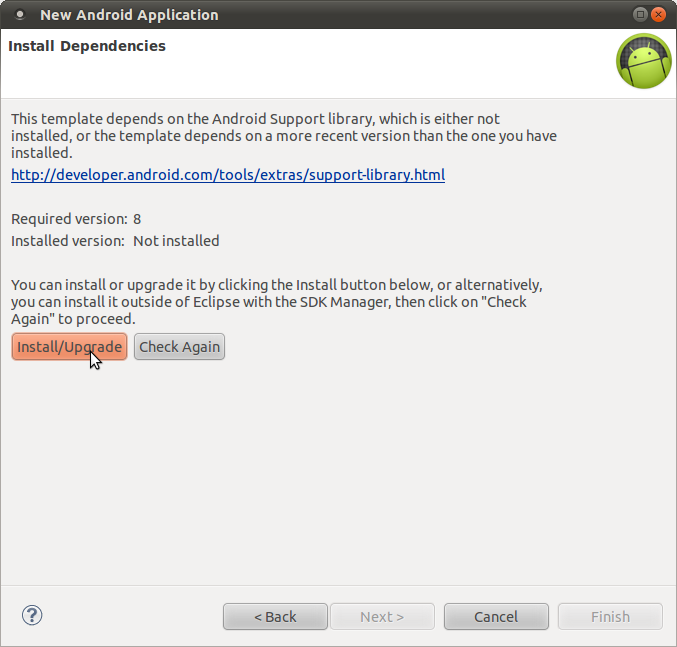 Check for updates in Eclipse regularly. And if you want to know of what's to come, visit the project page of the ADT team and especially their announcements of recent changes. The team announces preview versions there on a regular basis. Next week you will add an ActionBar using the library ActionbarSherlock to your project. Until then have a good look at the code and jump to Android's training session about fragments to learn more. Fragments are very important and it is essential to fully understand them! « Android: How to Use Two Data Sources in ListViews?